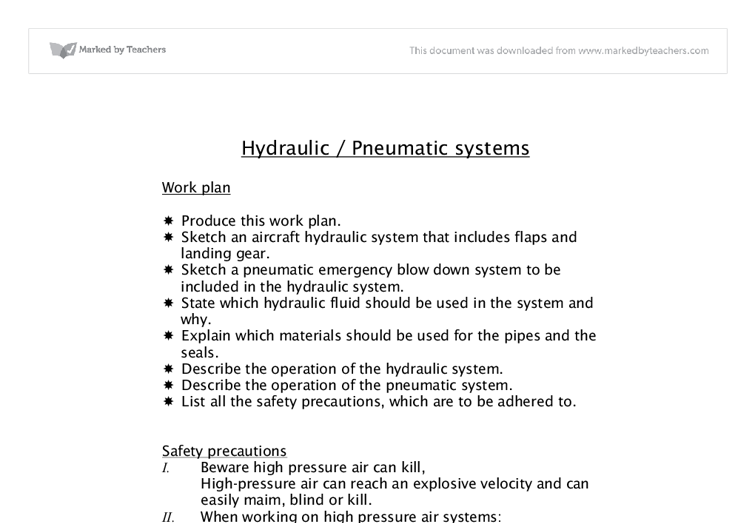 Hydraulic / Pneumatic systems Work plan * Produce this work plan. * Sketch an aircraft hydraulic system that includes flaps and landing gear. 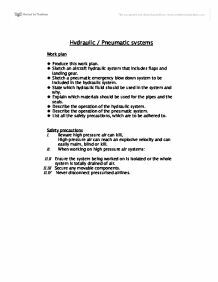 * Sketch a pneumatic emergency blow down system to be included in the hydraulic system. * State which hydraulic fluid should be used in the system and why. * Explain which materials should be used for the pipes and the seals. * Describe the operation of the hydraulic system. * Describe the operation of the pneumatic system. * List all the safety precautions, which are to be adhered to. Safety precautions I. Beware high pressure air can kill, High-pressure air can reach an explosive velocity and can easily maim, blind or kill. II. When working on high pressure air systems: II.II Ensure the system being worked on is isolated or the whole system is totally drained of air. II.III Secure any movable components. II.IV Never disconnect pressurised airlines. Hydraulic fluid used, seals to be used and identification In the system I have designed I would recommend using synthetic hydraulic fluid. ...read more. supplies a flow of fluid to the system. The pump, which has a variable volume, supplies fluid only when the pressure goes below a preset level. This operation happens because when the demand form fluid is high the pump expands its volume so that it can pump more fluid, as the demand lessens the volume is reduced until there is no demand, then the pump turns itself off. * Pressure switch illuminates a light in the cockpit when the pressure goes below a preset level. * Pressure regulator valve directs pressure to all services unless the pressure goes below a preset level it will then only deliver it to essential services. * Control valve controls the direction of flow of the fluid. * Thermal relief valve releases hydraulic fluid as it expands due to thermal changes but only when the temperature exceeds (due to the difference in temperatures on the ground and when the aircraft is flying at high altitude) a pre-set temperature. ...read more. The supply connection also connected to this line is used to top up or re-fill the system. From the pump if the fluid is not needed it is directed back to the reservoir. If the fluid is needed it is pumped through to the nrv the to the pressure switch. From the pressure switch it is pumped to the pressure regulator valve, from here it is directed to either essential services if the pressure is low or to all services if the system is operating normally. If the aircraft is being serviced or pressure is needed whilst the aircraft is "parked" the fluid is drawn from the reservoir through the filter by the hand pump. From the hand pump it is sent to the nrv and then to the pressure regulator valve and then on as described as above. Pressurised fluid enters the flap system from the power system through the nrv. From the nrv it travels through the control valve and to the starboard and port flapjacks. Fluid in the other end of the jack is forced in to the down line through the throttling valve. The pressure and thermal relief valves are not used closed in normal circumstances. ...read more. surname, followed by the first three digits of the vehicles model and ending in that days date. For example, if a customer of the name Bill Wilson rented out a Renault Clio on the 17th of October 2007, the rental number would be WILCLI171007. The mixing process has two distinct aspects, the intermingling of the molecules of the substances and the exchange of energy between the streams involved in the process. Molecular aspects are irrelevant when the streams are of the same chemical composition while no energy will exchange if the streams are initially at the same pressure and temperature. There might be more male users because they are often more familiar with the Internet and computers. I also believe that singles would use it more often than married people because they have a lot more time to look for the best product at its cheapest price, which married people don't have. Feedback is where the output from the system forms part of the input to the system. 3.1.2 Software and Hardware Components of an Information System a) Hardware is the physical components that make up a computer (e.g. graphics cards and speakers). The solution will be easy and quick to use as the business may need to deal with several customers on a particular day, therefore if the system is quick it means that they are not loosing customers. The solution should be professional as it is a representation of the business. Also some meta search engines don't list their results in the traditional way su ch as listing the results in order of relevance, some just instead just list the result based on the quality of the search engines they are using. Though some just use the the traditional listing method. I know how to log on Frog but I still struggle with get the support resources from Frog and ICT share area. I will develop my visionary learning by look at other people and also ask the teacher to help.